Whatever you do, don’t call them Native Americans, or any less politically correct term. They are Troglodytes, an ancient secret race of cannibals so brutal, they have been disavowed by all Native Peoples. When they kidnap a cowboy’s wife, he will set off after them, in the tradition of The Searchers. However, he has no worries she might “go native,” because he is keenly aware of her place on the menu in S. Craig Zahler’s Bone Tomahawk (trailer here), which opens this Friday in New York. All the trouble starts when two knuckle-headed outlaws go traipsing through a Troglodyte burial ground. Eventually, the thuggish Buddy will make it to the upstanding town of Bright Hope, but his sidekick Purvis will not. However, Buddy’s suspicious behavior and general bad attitude will get him shot in the leg by Sheriff Franklin Hunt. Since they can’t just let that get infected, they send for the medically trained Samantha O’Dwyer. She had been enjoying a quiet evening at home, tending the broken leg of her cattle-driving husband Arthur. Inconveniently, when morning comes, the sheriff discovers Ms. O’Dwyer has been abducted, along with the prisoner and his legit deputy. Leg or no leg, O’Dwyer is saddling up and giving chase. The duty-bound Hunt will ride with him, as will the roguish gambler and ladies’ man John Brooder, who nurses a pathological hatred of Native tribes. Old Chicory will also tag along. The old timer Hunt indulgently dubbed his “back-up deputy” might not inspire a lot of confidence, but he did not survive the Civil War and years on the frontier because he wasn’t resourceful. It is absolutely fascinating to watch all the hoops Tomahawk jumps through to make it okay for a cowboy to shoot a sort of, but not really Native American. (Does this mean the Toledo Troglodytes are now going to have to change their name too?) Regardless, those Trogs sure are hard to kill, but the manly cast is mostly up for the task, starting with the eternally cool Kurt Russell, who is as grizzled and hardnosed as ever as Sheriff Hunt. It is too bad Hollywood doesn’t make westerns as regularly as they used to, because the Hateful Eight co-star is a natural for the genre, just like his father Bing. Frankly, most of the film’s best scenes play out between Hunt and Chicory, played by the ever-reliable Richard Jenkins as a Gabby Hayes figure, but with dignity and common sense. He invests the Back-up Deputy with so much tragic heft, he arguably takes ownership of the film. In contrast, Patrick Wilson’s O’Dwyer is basically a wet noodle with a gimpy leg. However, as Brooder, the heroic anti-hero, Matthew Fox absolutely gorges on the Paramount Ranch scenery. With a running time of one hundred thirty minutes (seriously, its over two hours), Tomahawk takes too dang long to get from Bright Hope to the Troglodyte lair. Still, it is loaded with cool bits of business, starting with Roger Corman repertory player Sid Haig doing his thing as Buddy. The film’s respect for O’Dwyer’s abiding Christian faith is also unexpectedly refreshing, especially since Wilson played the abusive Evangelical in the laughably stilted atheist outreach film, The Ledge. 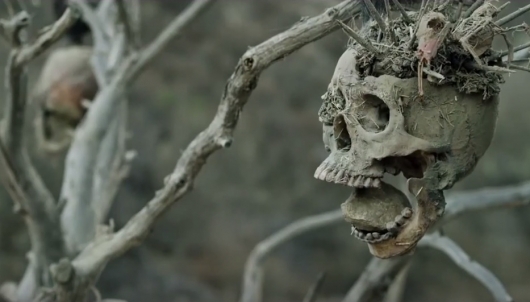 Despite some pacing issues, Bone Tomahawk is still an entertaining excursion into weird west terrain. 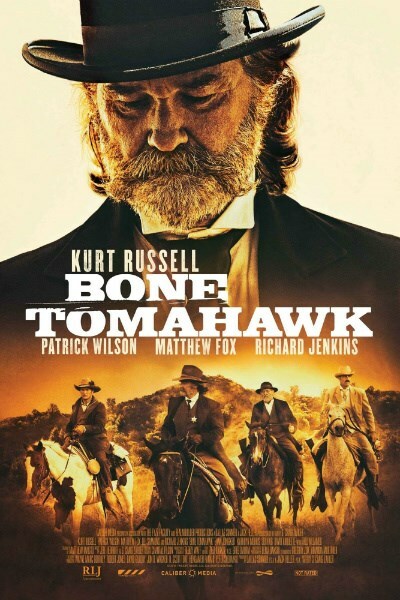 Recommended for Kurt Russell fans and Deadlands players, Bone Tomahawk opens this Friday (10/23) in New York, at the AMC Empire.